That's breathtaking! Love the pastels too! Mmm Silk, much warmer than it feels like it should be with out light weight it is! Really like the Duke silk yarn with their beautiful sheen and pretty pastel colors. But if I have to pick one favorite I'd go with the "Recycled Sari Silk Yarn Pink Magenta Hot Pink". Gorgeous color! Great price and best of all I saw and felt the neck warmer you've knit with similar yarn in blue and love how soft and fuzzy it is! I like the worsted weight silk yarn. My favorite colorway is Duke. Silk Yarn Lace Weight Silk Yarn Spun/ Maharaja Silk yarn I love green! 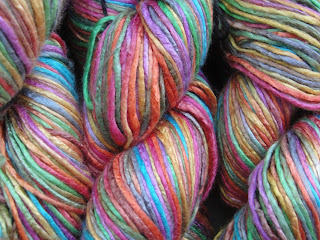 Oh, and my favorite yarn in your shop is this one: http://www.etsy.com/listing/81266345/silk-yarn-worsted-weight LOVE! My favourite in your shop is the Recycled Sari Silk Yarn Blue - gorgeous! Also shared it at my CafeMom group, Nutty Knitters. My favorite yarn from your store is the Maharaja Silk yarn. The color is so beautiful and vivid; it immediately makes me think of clover. I looove the worsted weight silk in lollipop. It looks super pretty! Thankyou for this giveaway. Your yarns are lovely. Very pretty. I twittered here about some pretty yarn from your shop. Absolutely gorgeous yarn! I love the Worsted Weight Duke Silk Yarn in the color Rainbow! All of your work is wonderful! Thank you for giving us this opportunity to learn more about you through your blog as well as the chance to win something. My personal favorite is the Silk Yarn Worsted Weight Duke Silk Yarn because of the wonderful color combinations. This yarn looks lusiosly lovely! My favorite in your store was the ocean colorway! Thanks for the giveaway. I love the look of these yarns,I love the Ocean or even the parrot colors.